Jonathan Kobes is one of six Trump judiciary nominees to receive a "not qualified' rating from the American Bar Association. He was confirmed to the appeals bench. More of Donald Trump’s judicial picks have received “not qualified” ratings from the American Bar Association than did those nominated by his four most-recent predecessors in the first two years of their presidencies, Bloomberg Law research shows. The ABA has given that rating to six of Trump’s nominees, while four judges total nominated to lifetime positions by Bill Clinton and George W. Bush in their first two White House years received the lowest rating. None of George H.W. Bush or Barack Obama’s appointees over the same period fell into that category. The appointments by past presidents were to trial, or district, courts, and all four were confirmed. In contrast, two of Trump’s “not qualified” nominees were to federal appeals courts. Appellate circuits are the highest courts that federal cases generally reach. Both of Trump’s “not qualified"-rated nominees were confirmed to the U.S. Court of Appeals for the Eighth Circuit, including Jonathan Kobes, whose standing generated the most recent controversy when his confirmation Dec. 11 required a tie-breaking vote by Vice President Mike Pence. Kobes had “neither the requisite experience nor evidence of his ability to fulfill the scholarly writing required” of a federal appellate judge, according to the ABA committee responsible for rating nominees. Judicial ratings have been in the spotlight during the record-setting push by Trump and Senate Republicans to reshape the federal courts with conservative appointments. Democrats have forcefully objected to lower-rated nominees and others with shortcomings they deem unworthy for the judiciary. To “have nominees that are not judged qualified by the bar association is deeply disturbing,” Dianne Feinstein of California, the top Democrat on the Senate Judiciary Committee, has said previously. Majority Leader Mitch McConnell of Kentucky has repeatedly said confirming Trump judges is a priority of the Republican-led Senate, and the GOP has forged ahead. The Senate has confirmed 30 of Trump’s appellate nominees, two U.S. Supreme Court justices, and 53 district court judges. Senate leaders from both parties were said to be negotiating possibly moving a new slate of district court judges. A vote could come as early as Wednesday night. The ABA ratings process became part of Brett Kavanaugh’s bitter Supreme Court confirmation battle this past fall. He’s now the newest justice. The ABA gave him its highest rating, but indicated it would reevaluate it after his fiery confirmation hearing testimony took a decidedly partisan turn. It dropped the reevaluation as moot after Kavanaugh was confirmed. The ABA ratings are purportedly non-partisan, but conservatives have been claiming that the ratings process is biased against them since the 1980s. “No one who looks seriously at instances of the ABA’s negative assessments of conservative candidates—especially on the malleable topic of judicial temperament—can dispute that the ABA’s liberal bias sometimes comes into play,” Ed Whelan of the Ethics and Public Policy Center, who has been vocal in supporting Trump’s judicial nominees, told Bloomberg Law by email. “How often and how intensely that happens depends largely on the composition of the ABA committee from year to year,” Whelan, who often contributes to the conservative National Review, said. Josh Blackman, a professor at South Texas College of Law Houston who also writes for National Review, suggested the ABA has gotten it wrong more than once. “The ABA has given unqualified ratings to people who went on to become prominent jurists, including” Judges Richard Posner and Frank Easterbrook, Blackman said. Posner and Easterbrook received “Qualified/Not Qualified” ratings, with the majority of the ratings committee rating them as qualified. Still, their ratings have often been described as low. Ratings are conducted by the Standing Committee on the Federal Judiciary, an independent arm of the ABA. They’re advisory and have been used for decades. 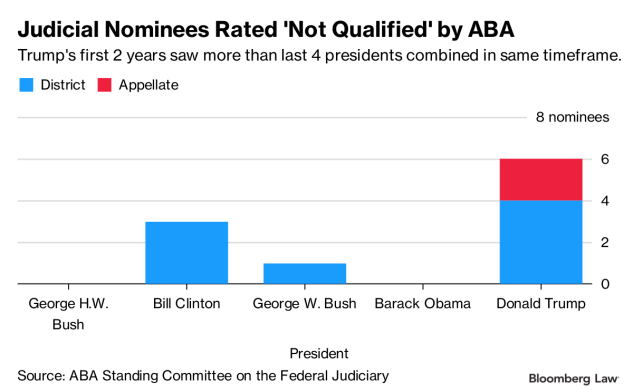 Trump’s relatively large number of low-rated nominees is likely at least in part due to his decision not to participate in the ABA’s process for pre-clearing candidates. Every president since Dwight D. Eisenhower has participated except for Trump and George W. Bush, ABA spokesperson Matt Cimento said. The number of Trump’s “not qualified” nominees shows that “ideology counts far more than competence” to his administration, Brian Fallon, executive director of Demand Justice, told Bloomberg Law via Twitter direct message. Demand Justice is an advocacy organization that has focused on opposing Trump’s judicial nominees.